Q1. Avoid staying out late. Reply: "In a crowded and built-up place like Singapore, there is no worry about staying out late even for a late-party." "A normal person would have sufficient aura or yang qi to keep themselves safe throughout all hours of the day. Only those 2 percent who are down and out.. Fortunately, majority of us falls in the 98 percentile and not that 2 percent!" Q2. Should I avoid swimming during the 7th month? Reply: "Ghosts also have their set of rules and laws to abide. Hungry ghosts are not suppose to go pull someone's legs and let them intentionally drown!" It is acknowledged by many that normal hungry Ghosts live in an alternate dimension and they are not suppose to interact or scare the living daylights out of ordinary folks. Q3. 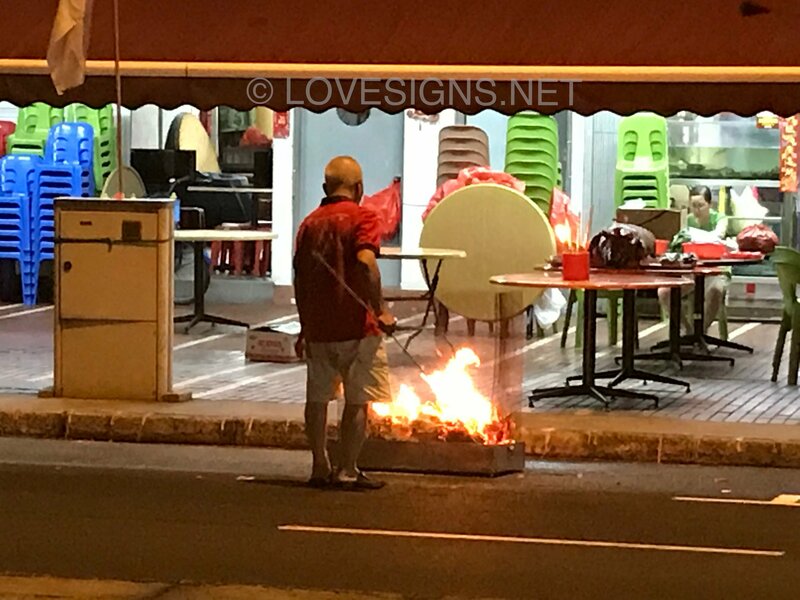 What about those leaving offerings to the ghosts during the 7th month? Are they doing good? Reply: To these ghosts, do you think that each and everyone will rush down to the dirty floor to consume these items left for them? To these ghosts, the offerings are just like Singaporeans displaying National Day flags celebrating an occasion. Thus to these ghosts, it is just the same ... something likes lights-up during Chinese festivities prior to Chinese New Year at Chinatown, that's all. Q4. Is it true that there are more wakes/funerals during the Chinese 7th month then the rest of the year? Statistically, death is spread evenly throughout the whole year. With the exception of certain events involving mass calamities. Otherwise, this is a myth. 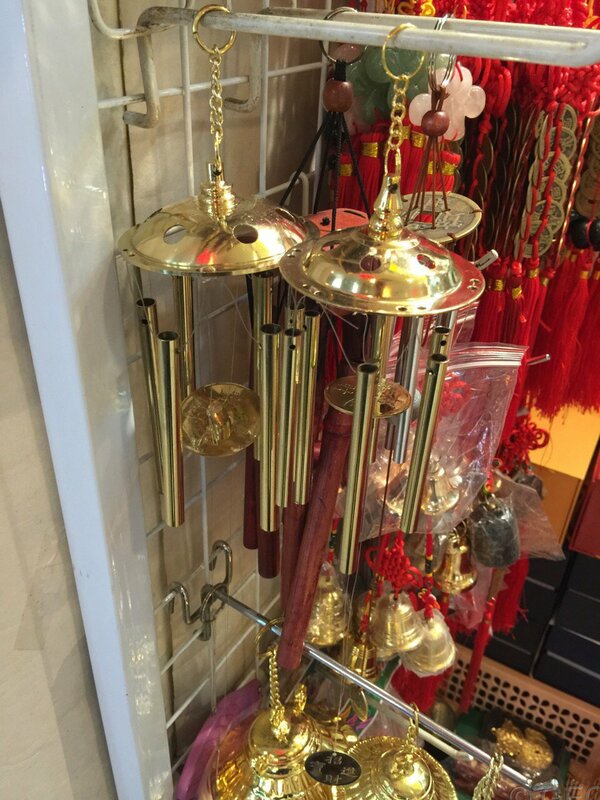 During the Chinese 7th month, carry on with what you normally do in your life. Life is about compassion, love and being there and enjoying it. Q5. Are the Lunar 7th month Ghosts really HUNGRY? These ghosts are in another realm or dimension. And they cannot come to our physical world to consume offerings. Unless, these ghosts or spirits enter a medium's body. Only then can they taste the offerings. Thus this is a misinterpretation or misconception: "In ancient times, it was truly not called the Chinese HUNGRY Ghost month but rather simply the Chinese Lunar Ghost Month." Q6. Is it beneficial to burn offerings to applease the Ghosts? Can I do away with yearly burning of paper items? For example, even if one burns hell notes or ingots or even paper cars, iphones and houses, it is not going to be converted to money "down-under". But if this makes the person performing this act happy or relieved; then it has served it's purpose! Many Buddhists & Toaists instead recommend a person to do merits or do good / kindness is a better option than burning such offerings. Priests and nuns and monks usually refer to the act of such burnt offerings based on the concept of "ashes to ashes'. And to them the act of burnings is instead a powerful symbolic gesture that when someone dies.. one cannot bring their wealth to the nether world. And not when we burn 10 paper ingots, these would be teleported to the dead as real ingots! This is never possible. How can chared paper turned into gold bars? etc? The bad one. The bad one does not only come out during the Chinese 7th Lunar month. The bad one or often called the DARK one comes and goes 24/7. But they prefer to haunt a location... rarely encounter these unless one goes to a place haunted by them. I caught a ghost in a photo! 1. In my opinion based on a reality check: "Can you afford to wait until after the 7th month to open the door?" 2. Frankly, it depends on the above. 3. Thus no point for me to say.. best not to. 4. But later to be told that.. Oh! What to do? I need to move in before 9 September (still in the 7th month) or that I really cannot afford to wait till after the 7th month. 4.1 Then no point asking about this at all. If you got to, you just got to. In SGP, no such thing as camping at East Coast Park with all your barang, barang. 5. Since you did not mentioned something about Para 4. "A need to move-in by yesterday sort-of-thing" then I assume = no harm right to wait till after the 7th month? 7. Vacant for long vs just moved-out? 7.1. Another consideration is that if the premises has been left vacant for several months; a better excuse to not go in during the 7th month. 8. Lower floors are a higher probability than very high floors like 30 storeys etc.. As these entities need effort to go up higher floors. Greater concerns for 8th storeys or lower especially ground floors or 2nd storeys. I do not need to move in so soon. So it is better to wait till after 7 th mth then open door. The unit is vacant for 1.5mth... if I open the door after 7 mth.. anything I need to do or just follow the standard open door Ritual. Yes, you have just answered the question. Pure common sense. If can wait or "tahan". Why not? 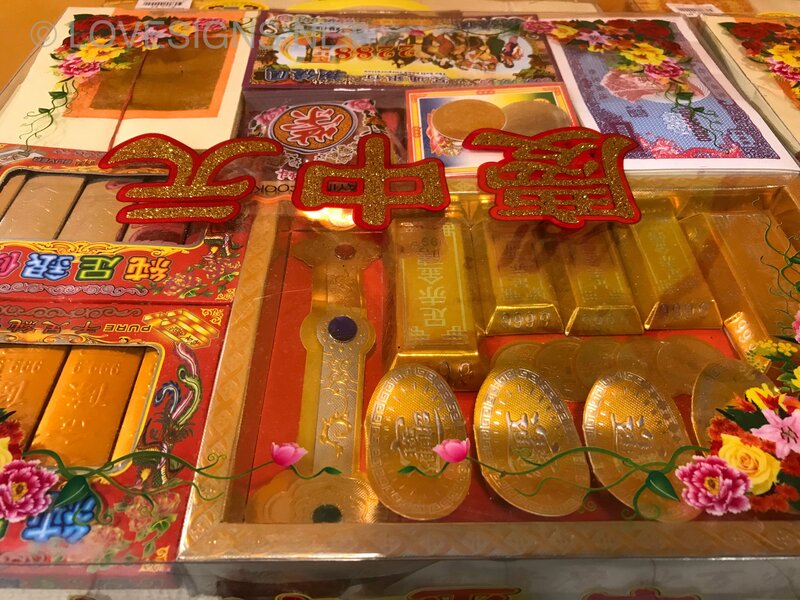 These are additional superstitions based on common sense during Chinese 7th Lunar Month. 2. Whistle while alone walking on an empty road late at night. Why would you want to do so? Put on ear-phones at an output sufficient to hear traffic noise (if any).. and enjoy your walk home! 3. Avoid urinating on a tree/plant. Don't be caught! It is a penal offence! 4. Avoid intentionally kicking or stepping on road side offerings. If accidental then really no choice! Just politely say sorry. 5. 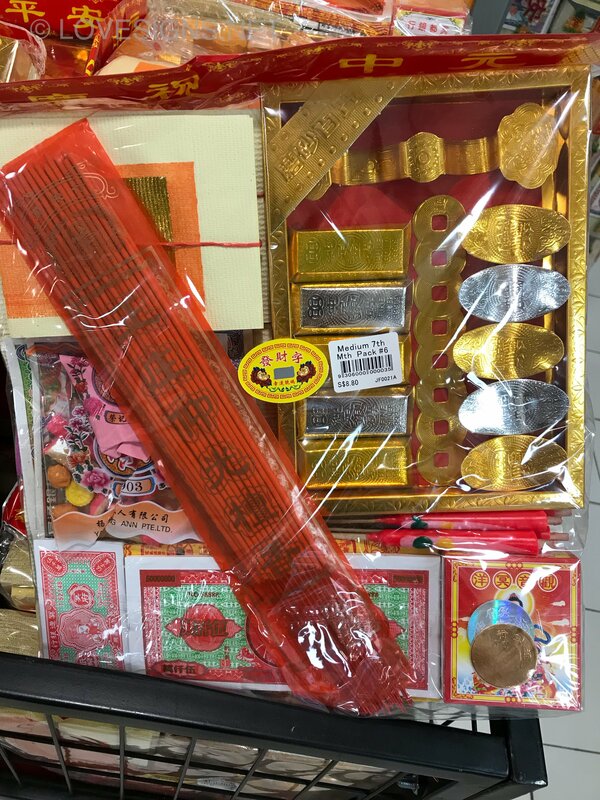 Avoid making jokes or snide comments on offerings or even if choked by the burning smell; quickly march out away from the area as far as you can. 6. If attending a Chinese Opera, it is a custom not to rush to sit on the first two rows. 7. If you do smell a scent while walking.. don't intentionally act like a hound-dog and follow the trailing scent. One should instead walk away from the scent (if possible). 8. Avoid picking out any interesting object along the road. Sometimes it could be a chain or some ornaments. Grasp your hands tightly and pretend to look away and walk to your original destination. 9. Avoid standing below a large tree at night even if to get shelter from the rain. For heaven's sake, bring or carry an umbrella. But do remember not to carry a RED umbrella. Or for ladies especially avoid wearing all RED dress and red high heels. 10. 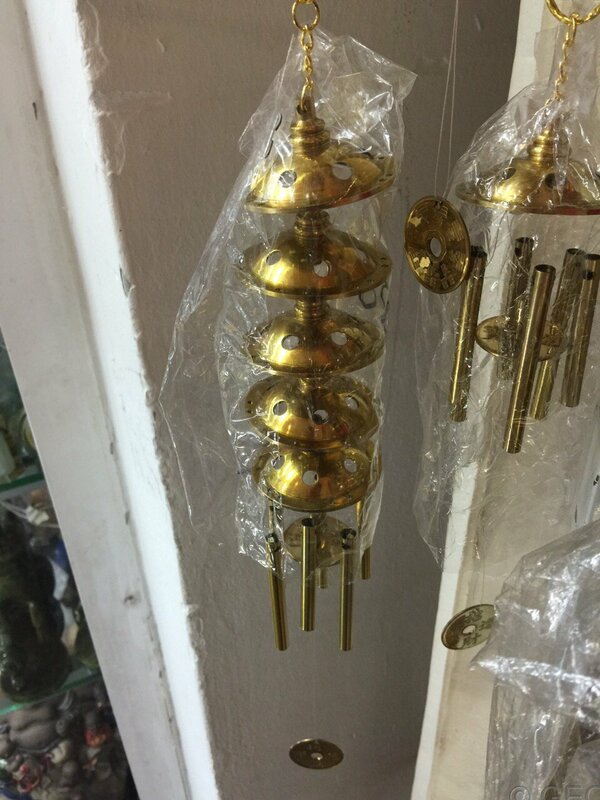 Avoid hanging solid rod wind chime(s) at home. as it might inadvertently attract the wrong ... into your home. 11. This one in a million... if you feel a presence of like someone tapping your shoulder.. don’t look back. Just walk on...and .. if you want to run away safely! 12. For a gambler; avoid going towards a tree and ask for a lottery number.